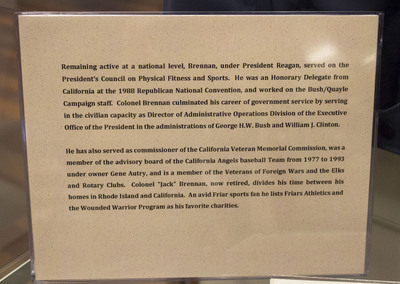 Remaining active at a national level, Brennan, under President Reagan, served on the President’s Council on Physical Fitness and Sports. He was an Honorary Delegate from California at the 1988 Republican National Convention, and worked on the Bush/Quayle Campaign staff. Colonel Brennan culminated his career of government service by serving in the civilian capacity as Director of Administrative Operations Division of the Executive Office of the President in the administrations of George H.W. Bush and William J. Clinton. He has also served as commissioner of the California Veteran Memorial Commission, was a member of the advisory board of the California Angels baseball Team from 1977 to 1993 under owner Gene Autry, and is a member of the Veterans of Foreign Wars and the Elks and Rotary Clubs. Colonel "Jack" Brennan, now retired, divides his time between his homes in Rhode Island and California. An avid Friar sports fan he lists Friars Athletics and the Wounded Warrior Program as his favorite charities.